The architects over at Esrawe gave Mexico City's Plaza Condesa a new face lift - no, seriously. The team of talented visionaries stepped in to add three new levels onto the facade of the performance theater, which now provide a ticket sales, reception to elevators, and souvenir shop. The renovation stirred up some strong feelings about how exactly it would authentically pay homage to the buildings 1950's roots. Esrawe wanted to Take inspiration from the time period that gave rise to the building, (the transition from modernism to post-modernism), it reclaims the value of functionality and applies it to the present time. The existing structure consists of 6 levels, a mezzanine and basement. Presently the ground floor has a lobby area, bar, coat room, kitchen, storage rooms, restrooms, and a stage with its backstage dressing rooms and bathrooms. The other levels house offices, more storage rooms and restrooms, and multiple halls. Esrawe construct the three levels above the lobby which lead into the performance hall, along with a little sprucing of the performance theater itself. Vertical wood panels dress the walls of the lobby and flow to the walls of the floors above, only stopping at window displays which pay homage to Mexican music and culture in the 1950's. 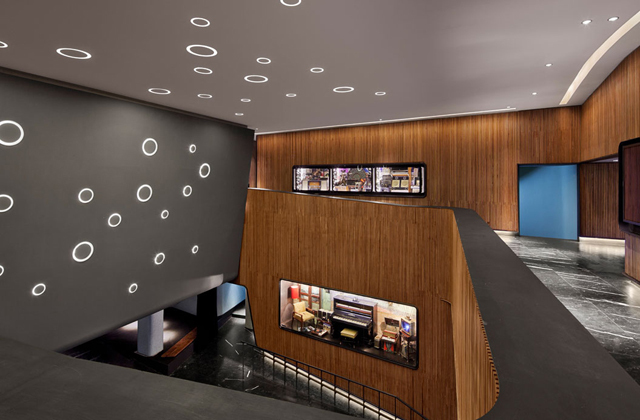 The gray ceiling and theater facade divide the wood and have disc looking rings of light which are scattered on the wall and up to the ceiling, creating a very theatrical lighting effect. 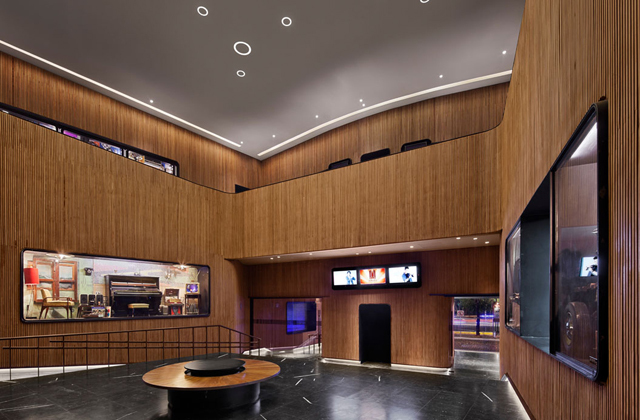 Inside the theater - Esrawe designed an over sized angular custom pattern and turned it into a wall paneling system which acts as the dominant decor feature in the space. 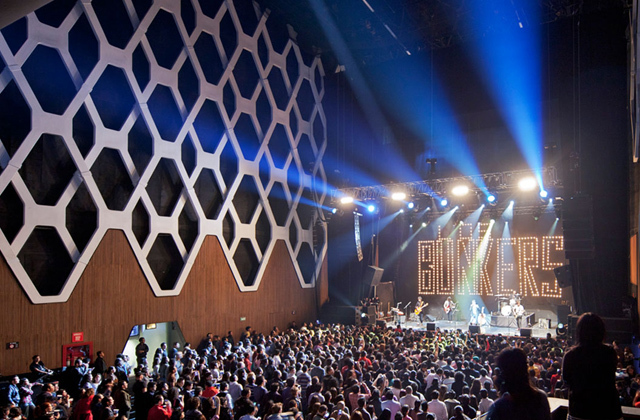 The vibrant and dynamic new venue is sure to attract the worlds biggest acts!